Wishing everyone a Happy New Year filled with joy and good cheer! Here’s a photo showing the dawn of the new year. It was 3 degrees below zero and I didn’t spend too much time taking the photo of the sunrise across the Mississippi river. 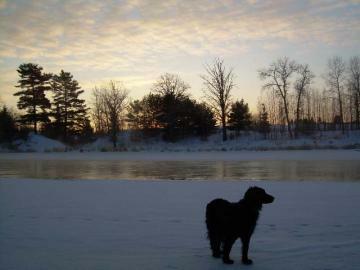 May you all enjoy the coming year as much as Raven (my dog) and I enjoyed the dawn of the new year! This entry was posted in Mississippi River, Morning Sky, Pictures and tagged , Dawn, dog, Mississippi River, sunrise. Bookmark the permalink.